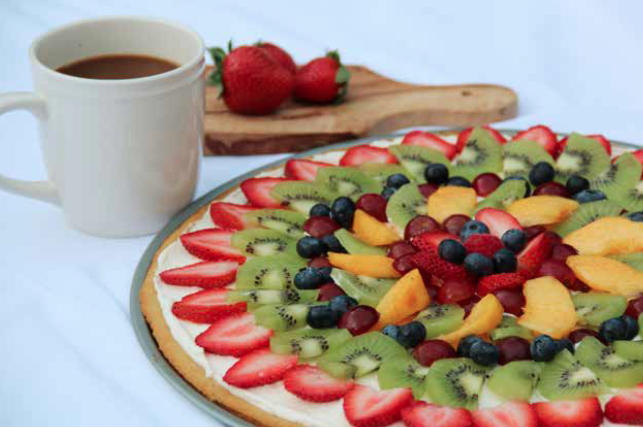 With summer just around the corner and fresh fruits in season, now is a great time for light, refreshing desserts like this fruit pizza. Brimming with juicy goodness, this luscious treat is visually appealing and tastes very similar to the real deal without using unhealthy ingredients. When it comes to choosing the kinds of fruit with which to top your pizza, be creative! Feel free to use a variety of fruits like pineapple, berries, kiwi, etc., or stick to fewer options. Also, have fun arranging the top! Kids love placing the pieces of fruit on the pizza, making this a great incentive to get little ones involved in the kitchen. Whether you have the time to creatively arrange the fruit artistically, or just randomly spread it on top, this colorful dessert is sure to be a hit! Note: Find this recipe and many more in my cookbook “A Better Weigh to Healthy”! (Page 230) Click here learn more and look inside the cookbook. Preheat oven to 325 degrees. In large bowl, beat together eggs, butter, sweeteners, and vanilla. Add dry ingredients and sour cream. Mix well. Spread on a round pizza pan and bake for 12 to 15 minutes. (It’s better to under-bake this recipe than over-bake it.) Cool completely. Beat filling ingredients until thick and creamy. Spread on top of crust. Top with fruit and berries of choice. *Prep Note: To make this recipe dairy free, substitute the sour cream in the crust with Sour Cream Substitute or 1/2 cup of veganaise. For all the Cream Cheese Filling ingredients, use 2 and 1/2 cups of Cream Cheese Style Frosting. †Weight Loss Note: If I want to keep this within a fats category (THM S), I use only berries. Oh. My. Word. I’ve made this several times at this point to fit within THM S guidelines and I have to tell you… it’s a huge hit! I’ve been taking a fruit pizza to parties and have NONE left! It’s amazing and now I’m thinking about what else I can do with the same crust. Thank you! I’m so glad you’re enjoying the recipe, Karina. =) Thank you for the kind words.